The instructions below assume you're starting with a cartridge that has already been mounted to a headshell. However we can help you mount a cartridge to a headshell, if that's where you're starting. Setting up a turntable is very easy and we can teach you how to do this. It's an extremely important task, as it helps reduce wear and improves sound, and yet it's an uncomplicated job. There are typically three knobs or dials that need turning and they control two elements of a properly setup turntable. 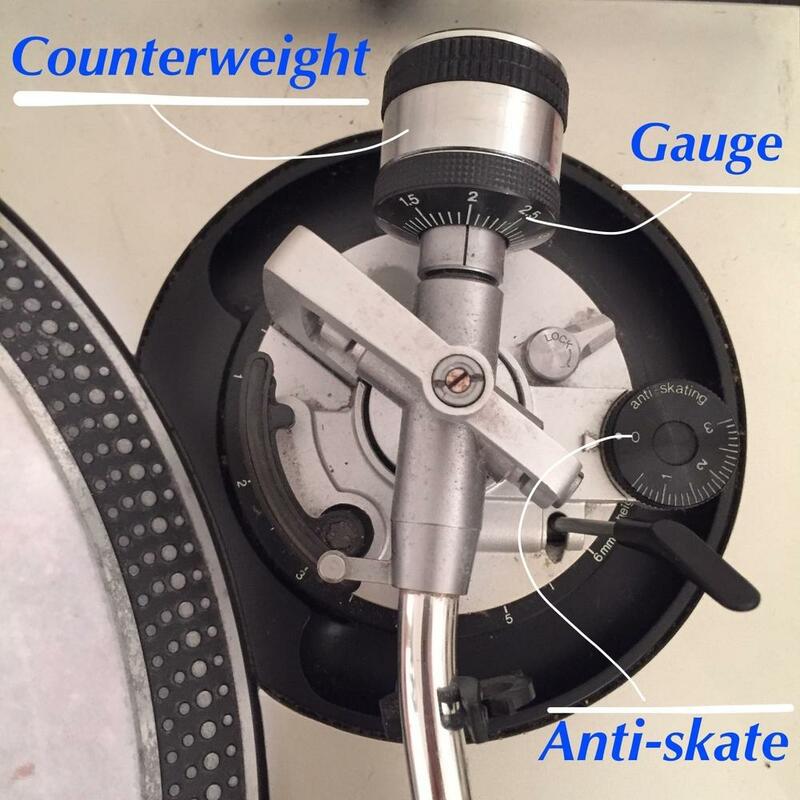 These parts (couterweight, anti-skate dial, and gauge) will help us dial in the correct settings for the tracking force and the anti-skate, also known as or anti- alias. Let's define those terms first. When we're talking about tracking force, we're talking about how much pressure the stylus is placing on the grooves of your records. This is largely controlled by that big weight sitting on the back-end of your tonearm. The weight turns left and right either adding or relieving the pressure exerted by the stylus. Too much pressure will result in a duller sound, and too little pressure will result in thinner sound and poor tracking (meaning the needle may skip across grooves where it shouldn't). As your record spins, the needle riding the grove is being pulled in toward the center. Anti-skate is used to apply a bit force the other way in an effort to balance out that pull. Typically the anti-skate is set to the same number you get from the cartridge manufacturer for the tracking force. So, if you set your tracking force to 1.5, then set the anti-skate to 1.5. First we want to get the tracking force set properly, meaning the right amount of pressure. This is easy. The proper amount of tracking force for your cartridge is supplied by the manufacturer. Just google it if you don't have the manual or look up the recommended tracking force here. Once you know the recommended setting for the tracking force, turn the weight counter-clockwise until the arm floats naturally in midair. Your needle should be hovering over the record like a pencil balanced on your finger. 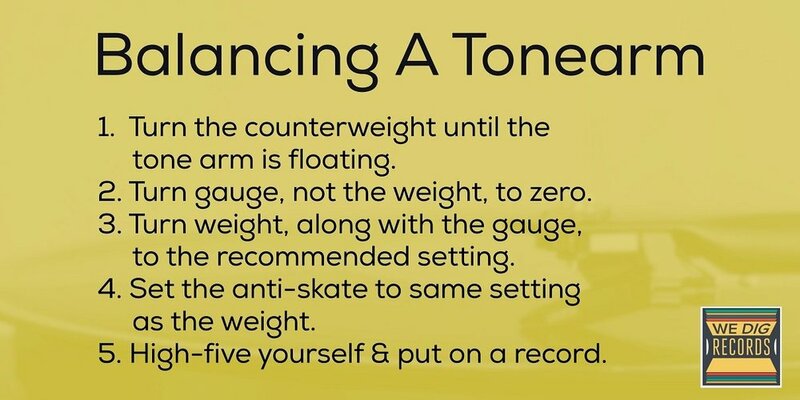 Now set the anti-skate dial to zero and turn the gauge on the weight BUT not the weight itself to zero. The arm should still be floating when you're done setting the gauge and anti-skate to zero. We just "zeroed out" the arm. Now turn the weight, and the gauge along with it, and dial in the recommended amount of tracking force. If you're given a range, say 2.0-3.0, keeping it in the middle is a safe bet in the absence of more technical tools. Now high-five the nearest person and throw on a record! A CBGB Mystery, Discogs and Dad Rock, and more!